Easy walking distance to activities for the whole family. Charming craftsman home in the ''Fort Grounds'' area of Coeur d'Alene. Inviting with a spacious front porch, that is perfect for relaxing. This house is a single level home with Mountain Views, fenced backyard for privacy, fire-pit and walking distance to Coeur d’Alene City Beach, this home is centrally located for an ideal vacation. There is a large, partially covered patio with great afternoon sun, perfect for relaxing, BBQing, and entertaining. This home features two bedrooms and two baths, living room, and kitchen/dining area. Living room features a large flatscreen TV and plenty of comfortable seating. From here you are also a 90-minute drive to 5 different ski resorts and a 30-minute drive from Silverwood Theme Park. 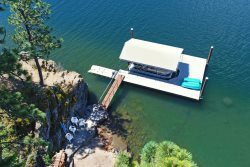 The house is also walking distance to some of Coeur d'Alene's best activities: Car d'Alene, Iron Man, Art on the Green, 4th of July fireworks, Farmers Market (Wednesday evenings), Winter Lights, and more. You couldn't ask for a better location to experience all that Coeur d’Alene has to offer with ease!